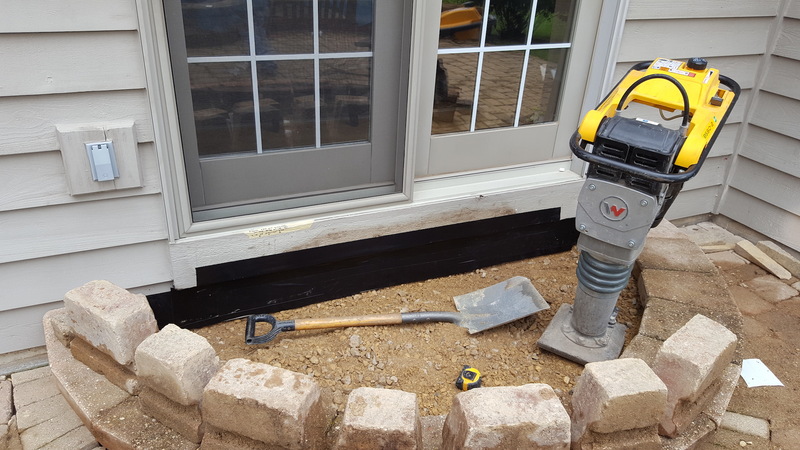 The homeowner at this St. Charles home called Paver Protector to fix their settling back door paver steps and to clean up their dirty worn out patio so they can get back to using and enjoying the patio throughout the summer. The steps were not in horrible condition but had settled some and the step caps came loose causing a tripping hazard as you walk down the retaining wall steps. Once we started taking apart the steps in order to rebuild we noticed that the original installer had not properly flashed the wood siding behind the steps. This led to the wood rotting. 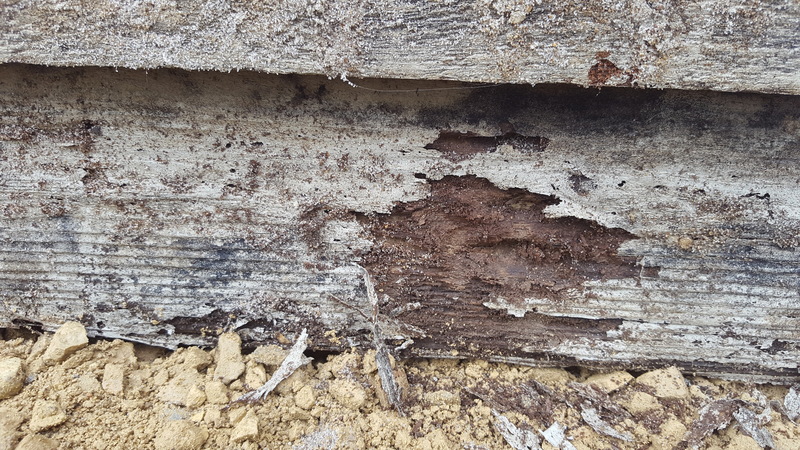 Luckily the wood siding wasn’t rotted through to the band joist(that’s the 2×10 that your floor joists tie into) as we normally see in steps that aren’t flashed. 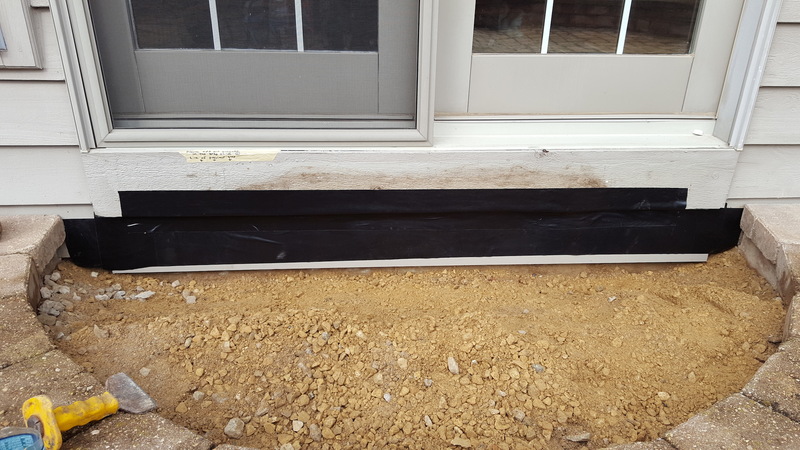 After replacing the rotten wood we made sure to properly flash the house so that moisture in the step unit will not come in contact with that house at all. Once flashed we recompacted the step area to ensure a solid base that will be free from settling in the future and then rebuilt the steps made form retaining wall blocks and relaid the pavers behind the steps. Next we cleaned the patio to remove weeds, mold, moss, dirt and the old joint sand which at this poitn was mostly dirt. Our cleaning process removes the old joint sand to a deeper level then our competition for a very important reason. The deeper you get polymeric sand in the joint the longer it will last. A simple surface cleaning with polymeric sand just covering the top of the joint will not last long at all. A lot of our competition will go this route because it is quicker to clean and uses far less polymeric sand. We don’t cut corners. We want you to enjoy your patio weed free for as long as possible so we go the extra mile. On day 2 once the patio is dry we return to sweep in our special polymeric sand that is rated for joints up to 6″. That’s right, 6″ joints, even though most joints are less than 1/4″. 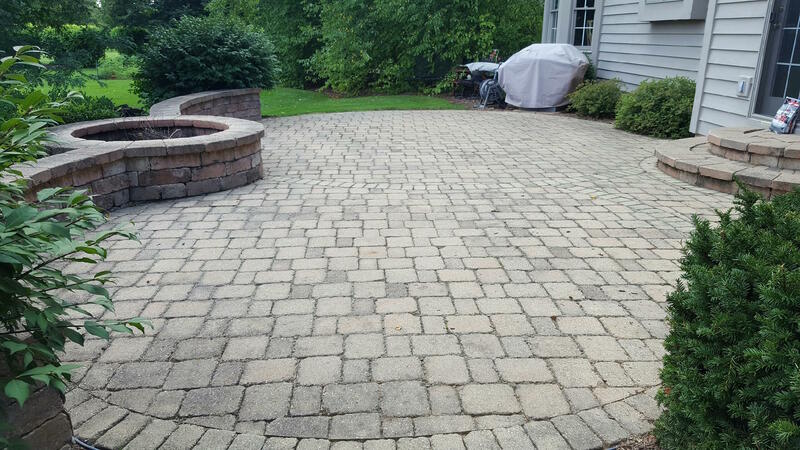 We use the strangest polymeric sand available as we have tested it and found it far outlasts standard paver patio polymeric sand that you find at big box stores and even from landscape suppliers. While some others are good sands, our will outlast any sand out there and we have tested to prove that. Once sand is swept into joints we run a vibratory plate compactor over the entire surface that will pound pavers down and rattle them to allow the sand to fall freely to the bottom of the joint and to level any minor high/low spots. Finally we sweep another round of polymeric sand into the joints. Once sand is complete we applied 2 coats of our 2 part urethane based wet look sealer. 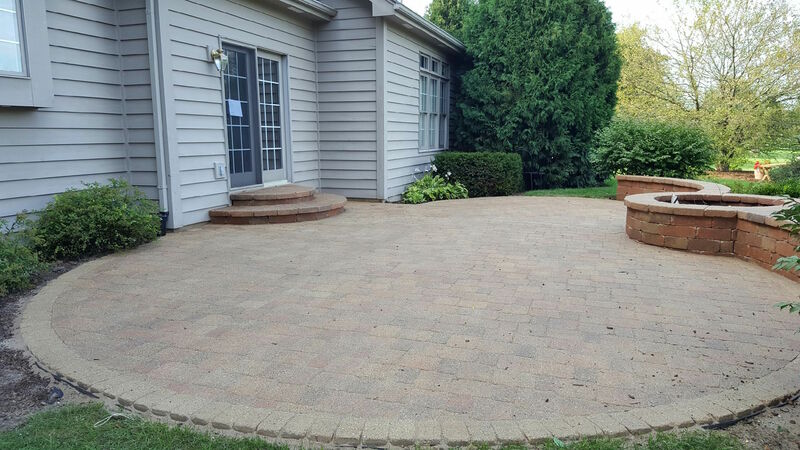 Our sealer provides a dark, non glossy wet look to enhance the paver colors while providing stain and fade protection. This urethane sealer will give you a darker look for a longer time then any solvent based or water based acrylic sealers. As you can see in the before and after photos the results are impressive but more so in person as photos never give you the full effect. 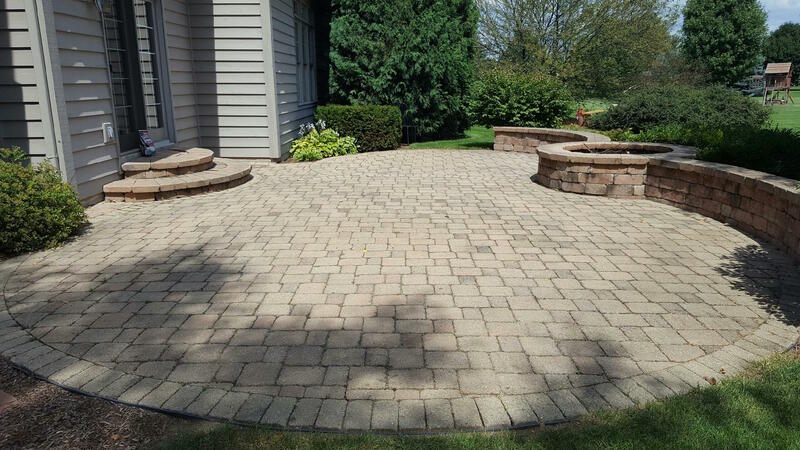 If your brick paver patio is in need of repair, cleaning or sealing call the professionals at Paver Protector at 630-488-0069 or fill out the free estimate form on the Paver Protector Website. 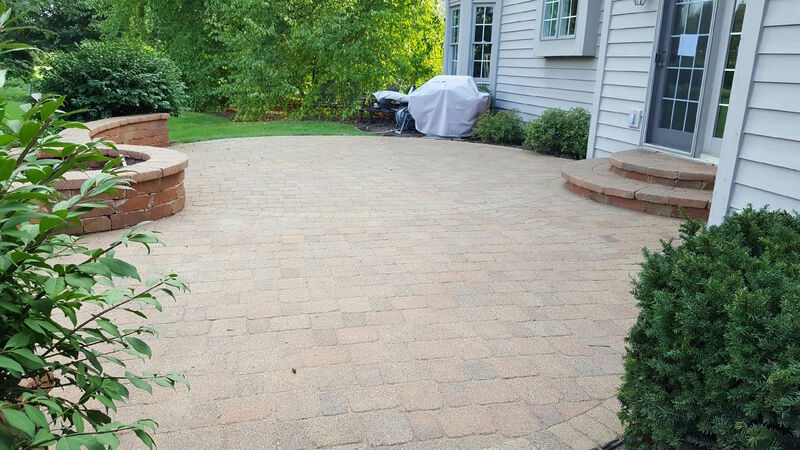 St. Charles, IL Brick Patio Cleaning and Sealing by Paver Protector Inc.